Google wants to build a four-star hotel and conference center on city land in Mountain View, CA, but has so far refused to offer union organizing rights for the development's workers. 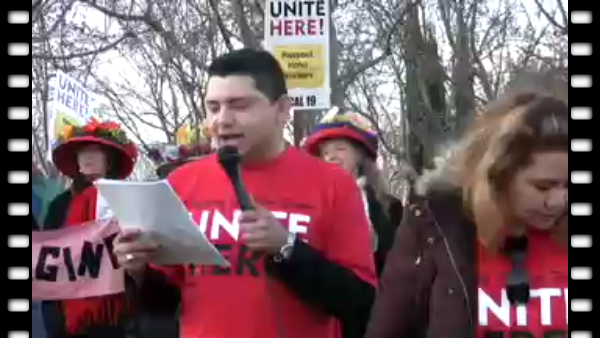 On Feb. 7th, 100 members of UNITE HERE Local 19 and community supporters staged a protest and picnic at Google Headquarters to demand respect, fair wages and the right to organize for Google's future dishwashers, housekeepers and banquet servers. Google entered into exclusive negotiations with the city of Mountain View for the hotel project next to its headquarters in September, and a development agreement is being finalized. Despite repeated requests, Google has refused to negotiate guarantees for hotel workers at the site to be able to choose union representation without company intimidation. The city spent hundreds of thousands of dollars preparing the site for development and intends to enter into a long-term lease with Google. In November, workers and residents tried to meet with company representatives but were denied a meeting and eventually escorted off campus by company security. Betty Guzman, a Holiday Inn employee and UNITE HERE member, says she attended the rally "not just for myself but for future hotel workers, who deserve living wages, affordable health care, and the right to choose a union." On average, non-union hotel workers start at seven to eight dollars per hour and do not have access to affordable health care. Stanford University students Pahua Cha and Theresa Zhen, whose mothers both worked as union hotel housekeepers, came out to Google for the evening rally. "We want to support these hotel workers so their children can have the educational opportunities we've had," said Cha. The city land where Google hopes to build the 285,000-square-foot hotel is currently occupied by rare burrowing owls, which are protected by the state Dept. of Fish and Game. Before Google can move in, the owls will have to move out. The city of Mountain View will be spending over $170,000 to purchase and maintain additional owl habitat so the Googleplex can be expanded. In the meantime, the hotel development has not yet received city approval, and Google will have to face growing demands from the community that it offer decent jobs and a right to organize for its hotel and conference workers. Raging Grannies promise to practice the song you hear in this video "Estamos Trabajando Por La Justicia" which we wrote for occasions just like this. Stay tuned for our next UNITE HERE gig!